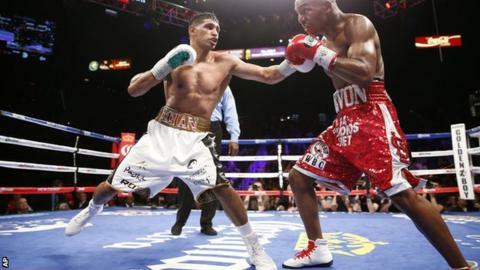 Boxer Amir Khan will donate a £30,000 pair of shorts to help rebuild the Peshawar army school where 141 children and staff were killed by the Taliban. The Briton, who is of Pakistani origin, wore the shorts, which have a waistband made from 24-carat gold threading, in his points win against Devon Alexander. "It was just very sad to see innocent kids being killed," said Khan, 28. "I want to donate the shorts for the Peshawar cause, rebuild a school and strengthen security around the area." Khan, who defended his WBC Silver welterweight title in Las Vegas on Saturday, became a father in May when his daughter Lamysa was born. "We are very lucky in England," Khan told BBC Radio 5 live. "We have good security and I will be able to send my little girl to school and know she will be fine, but in Pakistan you cannot do that. "They send the kids outside the house and do not know if they are going to come back. It's very sad to know that." Following Khan's victory, his 30th in 33 professional contests, the Bolton boxer wants to fight unbeaten American Floyd Mayweather, regarded as the best pound-for-pound fighter in the world. However, Mayweather wants to fight Manny Pacquiao instead and Khan says Mayweather is "looking for excuses not to fight him". "Fingers crossed I get the Mayweather fight," added Khan. "Styles make fights and I really believe my style would give him a lot of problems. "I'm a big enough name that if I could get Floyd to come to England we could sell out Wembley Stadium."